Shimano offers two Internal Gear Hubs (IGH) that have quietly made there appearance on a few trikes over the last few years. Priced at a fraction of a Rohloff they both have there purposes as implied by the stoutness, gear ranges and costs of each unit. 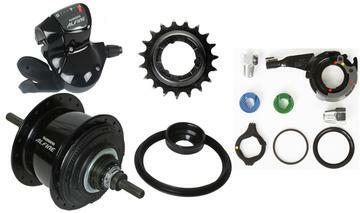 Shimano quality in a transmission at a reasonable price is hard to beat, but may not be ideal. Alfine is pronounced "al-feen-a, but most people still say "al-fine". All is fine. Prior Nexus models came in 6,7 and 8 speed versions and Shimano appears to have targeted a unit that would approach the Rohloff at lower cost with the release of the Alfine series. The existing 8 speed Nexus was still selling so they gave it a bit of a facelift and wider gear range. Adding an 11 speed unit to the mix of internal planetaries also adds a bit more drag which was mitigated by using oil rather then grease as a lubricant. Shimano chose oddball cable pulls limiting which shifters will work with either Alfine. Alfine/Nexus 8 (SG-501) contains a stout set of gears that use grease as the lubricant. Typically grease needs to be changed every 3000 miles or 2-3 years depending on how much moisture is present. Most repair parts are generally available but rarely in stock at the LBS so plan on services taking a week or more. Some of the more trouble prone parts in the Nexus have been upgraded but the grease service is still a major detraction to this unit. Weight is about 4.5 lbs for those counting trike calories. Yes its very heavy for 8 gears, over 1/2 a lb per gear. Internet pricing is in the $250 range which is a bargain for the unit. That's doesn't include a shifter. IGH shifters very much need to be indexed to avoid partial engagement. Having a cable pull of 5.38mm doesn't match normal derailleur shifters so shifter options are limited. Or you can calculate the gearing and speeds using Gearmaster and selecting the Nexus 8 tab. The hub seems to only make noise on shifts. Shifting can be done while still or while pedaling however you'll need to back off the pressure a bit on shifts while pedaling. Gears feel like they have pretty big jumps between them especially 1st to second. Alfine 11 (SG-700) is a more refined transmission with a few more gears. Nearly silent, it doesn't even give an audible click on gear changes. It downshifts rather well under power but upshifting needs a tender pressure on the pedal. Oil filled with low drag seals translates into seepage of oil; maybe an annoyance but also a service condition to be aware of. At 3.8 lbs, that's not too bad having 11 gears or a tad over 1/3 lb per gear. Cable adjustment is a bit tricky at first and cables should be lubricated. Route cables such that any bends are not aggravated while turning. Once the cable is set up correctly its almost maintenance free and shifting works very well. Priced online at about $600 for the complete kit including trigger shifter and tensioner. Cable Pull is just a fraction of a millimeter less then the 8 speed so once again, Shimano strikes with an oddball cable pull. J-Tek made a statement that one day they would offer a custom bar-end, that was 3 years ago, they don't have it yet. The Alfine 11 is also included in the Gearmaster calculator on the Alfine 11 tab. In lower gears the Alfine 11 feels a bit spongy climbing hills. Most of that comes from gear backlash, oil extruded from between gears, and deformation of the outer ring gear. Its hard not to imagine that the sponginess is somehow robbing efficiency. As it gets worse with loads and dyno's don't apply those levels of loads, any lost efficiency won't be recorded on a dyno. The Alfine is decent product for the price but after owning one you'll still be considering a better IGH as a later upgrade.